This is one of my favorite projects that I've used a few times this week already! See here for the complete instructions. Why have I used this tutorial several times this week already? Well, you see, last week my husband got into the MBA program he was hoping to, and it's not in the area, which means that we're moving---to Chicago! And very soon too as his semester starts in June! So, I've been madly staging the house to sell and this tutorial works great for adding a little something extra to your pictures. Don't worry though, new projects arriving shortly! I'll be needing some help too with some testing! So stay tuned for opportunities to test out some projects before they are released here! Also- Don't forget to enter into the Design Challenge at Fresh Nest Design! There's a $125+ Kelli Kit up for grabs to the winner!!! Congrats again! I'm sure you are in busy mode! I love dressing up picture frames like that! Can't wait to see what all you have in store for us! Chicago is one of my favorite cities of all time. You will love it there. So much to do. Are you moving to the city or to the suburbs? I've lived north of the city my whole life and know LOTS of the great places for awesome craftiness! Jori, We'll be moving to Evanston, which is also north. Maybe we'll be neighbors! :) I can't wait to see all the crafty places! Congrats! I hope you enjoy your new adventure in Chicago. And I love the frame. Too awesome! Congrats on the move! I have only been to Chicago a few times so I can't help you in that department. 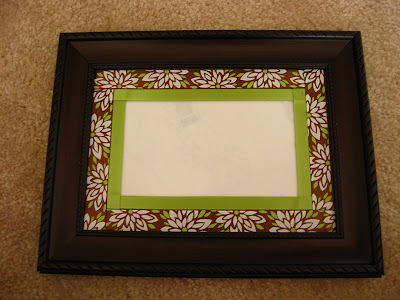 But I love the ribbon Frame idea! I've been reading your blog for a little while now! I love your craftiness and tutorials! We live in Illinois, not too far from Chicago and like to take the kids up there often. This spring we walked along Navy Pier and took a look at "The Bean." (At least that's what my husband called it. The beach along Lake Michigan is wonderful in the summer! And the Aquarium is AMAZING! You'll have fun! I live in Evanston right now and it's the best area to live in. There's the Paper Source store on Central St. that I love and Paper Doll in Wicker Park on West Division St. If you're looking for fabric, there's Vogue Fabrics on Main St. You're going to find tons of cute little shops and restaurants throughout Evanston and the nearby neighborhoods. Welcome to the area!